Our focus is to fulfill the Great Commission (Matthew 28:19-20) making disciples of Jesus Christ, Baptizing in the name of the Father, Son, and Holy Spirit, and teaching obedience to the commands of Jesus. We proclaim the Word of God as found in the scriptures of the Old and New Testament. 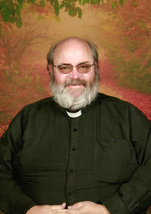 Pastor - Stephen A. Curry. Steve Curry was appointed to La Vernia in July of 2013. Steve is a second career pastor after 27 years as a computer programmer at Trinity University. He received his Master of Divinity from Perkins School of Theology at Southern Methodist University. His wife, Sharon, works at Trinity University and his son, Benjamin, attends Texas A&M San Antonio and serves in the Texas National Guard. Pastor Steve will be relocating to First UMC, Junction, and London UMC in July. Our new pastor will be Wesley Craig who is currently serving Cedar Creek UMC. Youth Minister - Phillip Higginbotham. Phillip and his wife, Diana, moved to South Texas from the Dallas area in 2006. They have three daughters; Courtenay, Abigail and Elizabeth. Phillip has served in youth ministry in both volunteer and staff capacities for the eight years before coming to La Vernia UMC in 2015. Director of Child Care Ministries - April Burns. ​April grew up at La Vernia UMC and was married in our sanctuary. She and her husband, Jeremiah, have a daughter Mckenna. Before joining us in 2018, April was the director of La Vernia Academy. Administrative Assistant - Cheryl Cardenas. Cheryl previously worked for La Vernia United Methodist Church as our Wesley Nurse. She returned in 2015 as the Administrative Assistant working in the church office. She graduated from the University of Manitoba with a nursing degree. Cheryl and her husband, Ricco, have two sons, Brennin and Scott. Rico is a firefighter for the San Antonio Fire Department. Business Manager - Kim Santos. Kim Santos graduated from UTSA with a business degree specializing in human resource management. She began working for La Vernia UMC in 2016. Kim has been married for 22 years and has 3 kids, Sam, Sophia, and Ian. Her husband Cesar works for HEB. Choir Director - Randy Cobb. Randy and his wife, Janice, have seven children: Kristen, Sandra, Brandon, Bethany, Megan, Brook and Zachary. From Odessa, Texas, Randy graduated from Southwest Texas St. Univ. in 1990 with a degree in Music Education. He has taught choral music in East Central ISD for 15 years. He has served as Music Director of Rolling Oaks Christian Church, Blanco UMC, Shepherd King Lutheran Church, and Alamo UMC. Pianist - Linda Summerfield. Linda plays the piano for the 8:30am worship service. The earliest records show that Rev. John S. McGhee, a Methodist Circuit Rider, held worship services in the area as early as 1853. La Vernia Methodist Episcopal Church, South, was officially established in 1876 with Rev. John E. Vernor as the pastor. The first church building was constructed later that year. FM 775 from La Vernia City Hall. On August 20, 1886, the Indianola Hurricane of 1886 hit the Texas coast. A tornado spawned by the storm struck La Vernia destroying the church. A new chapel was constructed on the same site on Chihuahua Street and dedicated in 1887. In 1968, the Methodist Church and the the Evangelical Brethren denominations merged to form the United Methodist Church. In 1970, Post Oak Evangelical Brethren Church merged into La Vernia UMC. On July 26, 1996, a new church building was consecrated at the current location Bluebonnet Road (FM 775). The next year, the 1887 Chapel was relocated from the site on Chihuahua street to its current location, a distance of about a quarter mile. In 2003, a Family Life Building was added. On August 26, 2017, Hurricane Harvey struck the Texas coast. The roof of the 1887 Chapel was torn off. The building was repaired and restored. Rededication was held March 23, 2019.